We had a busy year! 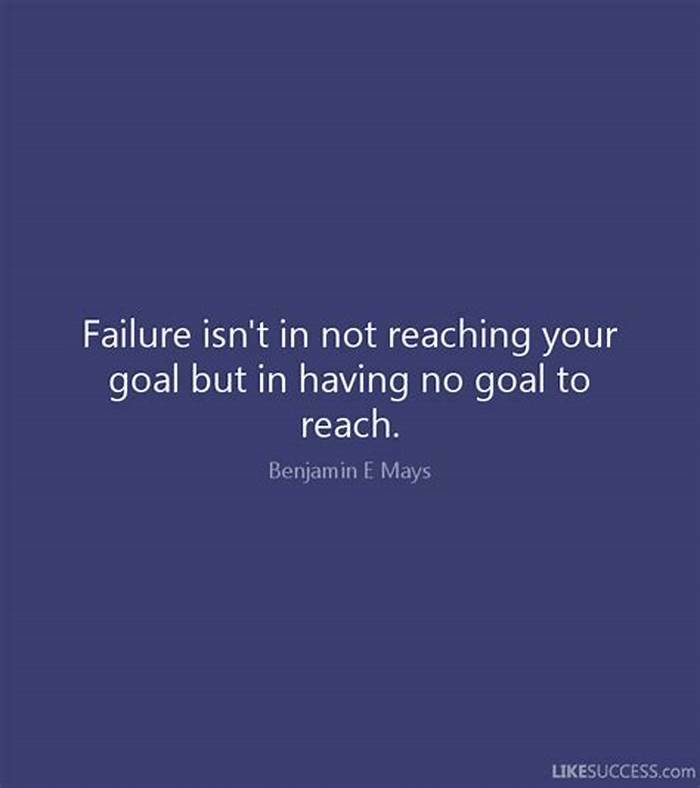 I’m using that as an excuse for why I fell short of my cycling goal. We built a new house and had a lot of fun doing it but it was distracting. To compound matters we had a short autumn. The cold arrived very early which prevented us from enjoying those typical great fall cycling days. Yes… I’m a wimp. When the winter winds start to howl, I’m curled up inside with a hot toddy! Spending 3 weeks at our new summer home in the historic resort town of Saint Andrews by-the-sea, New Brunswick (Atlantic Canada). What I’ve come to observe… there are hills here too! and the map of one our favourite 25 km cycling route looks like a rocket ship! Happy Spring everyone! This blog has been sorely neglected but that is about to change. Weather is finally warming up and snow is melting. 2017 was the third year in a row that I fell short of my cycling goal. After we climbed Mount Katahdin in late August we started seriously talking about hiking the Appalachian Trail in 2022. We had a beautiful fall last year and we got the hiking bug so the bikes didn’t get used as much as usual. We still got plenty of exercise and fresh air just nothing I could track here! I expect that this year is going to be similar. We are becoming obsessed with hiking plus we’re building a house this summer so, taking those two things in to consideration, I have revised by cycling goal to 2,000 km for 2018. Stay tuned for adventure and mileage updates coming soon! Got up early one morning on our vacation and rented hybrids near Central Park. We headed straight towards the waterfront. The rush hour traffic was heavy while trying to navigate the New York streets but the worst part was the pedestrians… they were crossing against the lights, walking and/or standing in the bike lanes. It was brutal! Once on the dedicated bikes lanes it was smooth sailing. Could have biked longer but had to meet up with our friends for lunch in Chinatown at the Deluxe Green Bo. Soup dumplings! Yum! Took a quick trip over to London to join my husband on his business trip. Spent part of an afternoon cycling around the city on the Santander rental bikes popularly known by the locals as “Boris Bikes”. We didn’t break any pace records but we got a cool map (below). 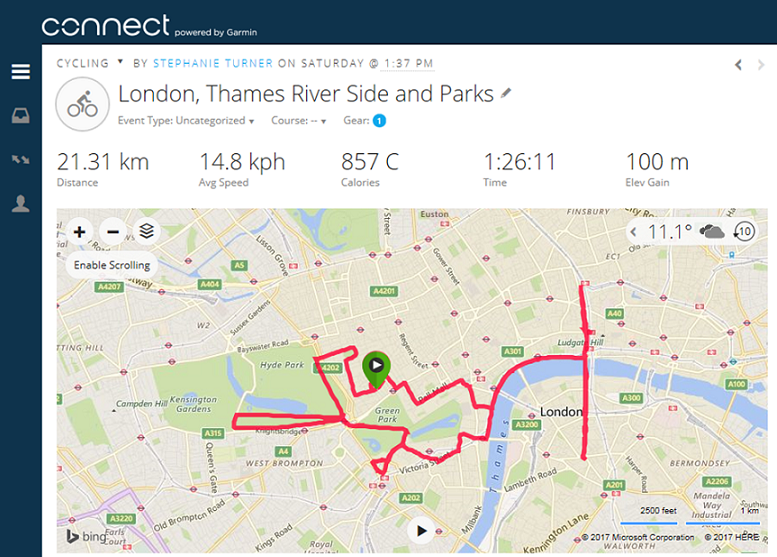 Our 20+ km ride included some cycling along the Thames river on the bike path as well as on some bustling city streets dodging double decker buses and London cabs. Rides through Green and Hyde Parks were considerably less stressful! The entire exercise was not helped by the fact that we had to bike on the “wrong” side! Spent three days cycling in the fantastic city of Montreal. This city understands cycling infrastructure and does it right! The drivers are crazy and inconsiderate of each other but they seem to look out for cyclists and pay heed. Our community has a brand new mayor. He’s young, energetic and he cycles! The local cycling club thought it would be a great idea to get area cyclists together for a ride with the mayor to discuss cycling infrastructure & safety and to show our new mayor that there is a growing culture of cycling in Saint John. A case of road rage! This happened to me today. 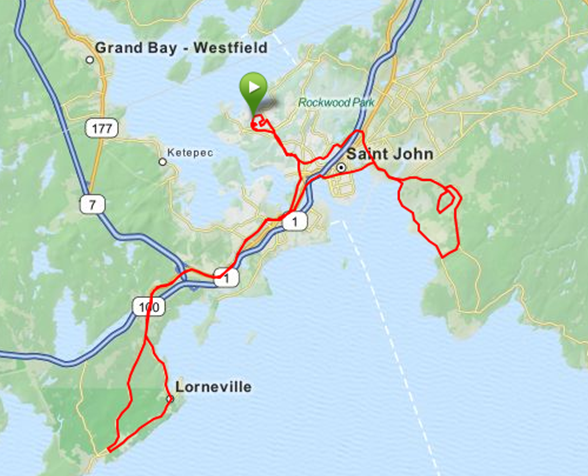 Went for a 100 km ride on the Kingston Peninsula. Was a spectacular day until we encountered a local red neck with road rage and a severe hate on for cyclists. He came up behind us (not another car in sight in either direction) and buzzed us close… clearly to send some kind of message. It startled me and I let out a little scream…Rob flipped him off. He immediately pulled over and rolled down his window and waited for us to approach. Rob asked why he didn’t give us more room and he started with his rant about how we should not be on those roads and that “you people will never learn”. We kept cycling. He roared past us again and stopped and got out of his car. I was freaking by then. He charged Rob. Rob got off his bike to get away from him and he picked up Rob’s bike and started to walk away with it. We eventually got it back. It was a total scene! We stopped at the RCMP in Hampton and gave a statement, we had his license plate #. The RCMP know the guy and there was a similar complaint against the same guy 2 days ago. He drives a rust coloured sporty car…like a Cavalier. Constable says he lives near the Gondola Point Ferry and is well know to the police. My advice is be careful and if something like this happens, keep your wits about you and take photos with your phone if you can. 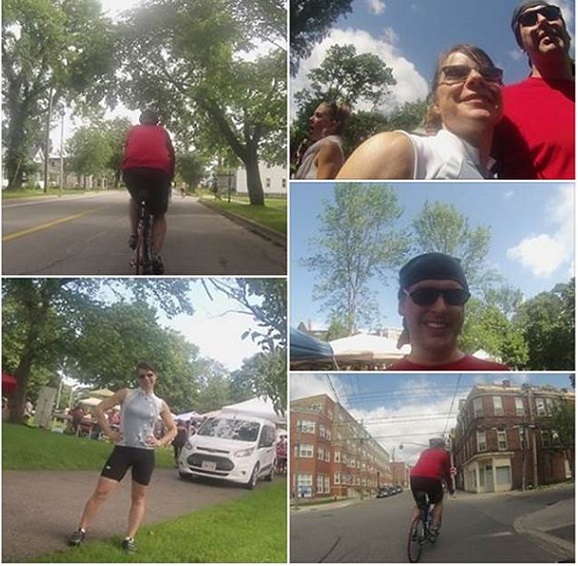 65 km cycling around Montreal, Quebec. Montreal is a great cycling city! Lots of dedicated trails and well marked cycling routes throughout the city. 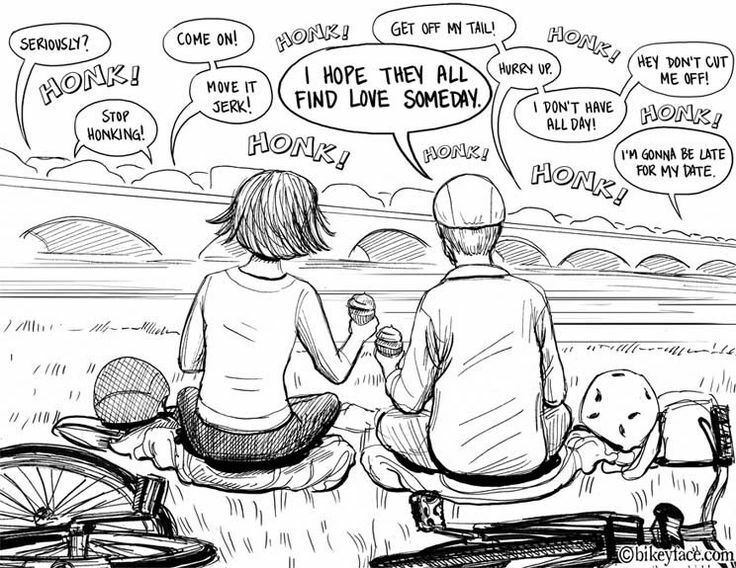 Observation…most cyclist in this urban area don’t wear helmets. Yikes! 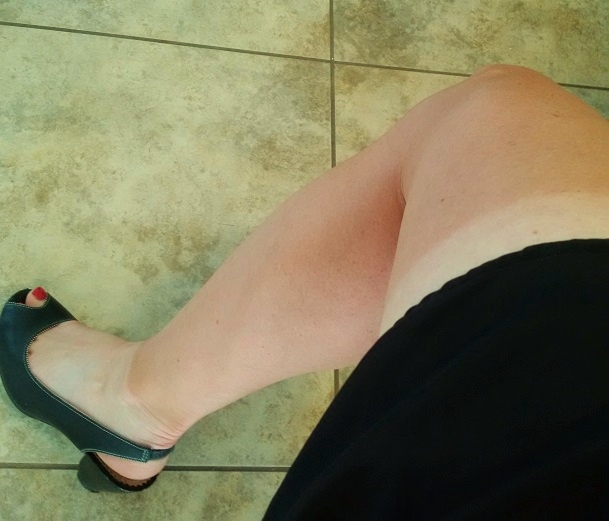 I’ve heard of a farmer’s tan… but cyclist’s tan? This is ridiculous! Bike rental $35 per day, Cerveza Negra Modelo at that little Mexican patio $7, day spent cycling around NYC… priceless! Click on the image below to view a 3 1/2 minute video of day touring Manhattan. Sitting at my desk dreaming of warmer days like this one when we rode along the beautiful Kennebecasis River. 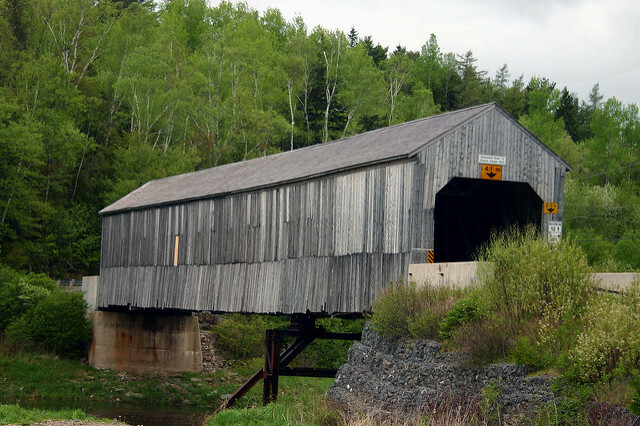 Much of the footage is from the Kingston Peninsula but also takes you through Quispamsis, Rothesay and Saint John. NOTE: This short video was complied using GoPro time lapse photos (every 30 seconds). I slowed down the shots where we are cycling at a slower pace or stopped. 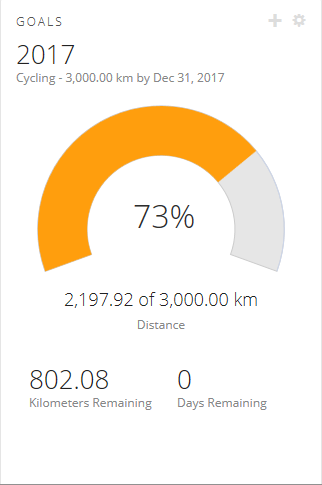 Reached my annual goal of 3,000 km on October 19th this year almost a full month ahead of last year. Yay! This is a follow up to Monday’s post. Although it was a fantastic day and a great ride I was not in top form. The climbs and the wind bothered me more than usual. I was recently diagnosed with low iron and I’m thinking that may have been a contributing factor to my fatigue. Since being diagnosed, I’ve been eating more iron rich foods such as hemp hearts, smoked mussels & oysters and red meat. I’m also taking an iron supplement at bedtime with a glass of apple juice (the vitamin C is said to aid significantly in iron absorption). Unfortunately, from what I’ve read, it can take up to 8 weeks for my new habits to have an impact on my iron levels. To make matters worse, physical activity has been found to reduce iron levels in women so my cycling could be compounding the problem. If anyone has any ideas or advice for me…please drop me a note in the comment section below. On Thanksgiving Monday hubby and I set out to tour the city. It just happened that our route took us by (or at least very near) much of our area’s energy installations. 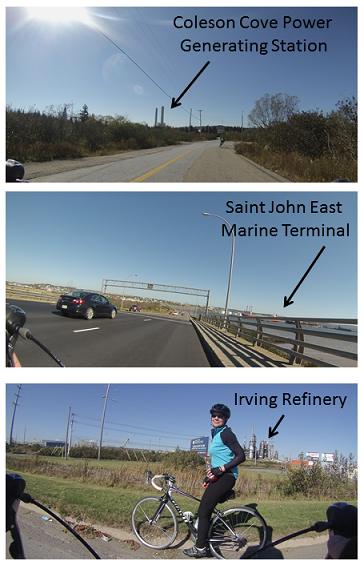 Our 75 kilometre ride took us west to the Coleson Cove power generating station. Next we headed east across the causeway and by the East Saint John Marine Terminal. We then rode by the Irving Refinery on our way out to Red Head. We didn’t quite make it out to the Canaport Liquid Natural Gas Terminal before heading back home. It was a beautiful fall day! My husband and I have officially cycled 10,000 km together. This is the mileage we’ve registered since we started keeping track in 2010. When we started biking together we didn’t have the right equipment, the right clothing or the right gadgets for keeping track. It started with a bike ride around the neighbourhood after supper one night and slowly grew from there. 10,000 km translates into 400-500 hour. The bulk of those miles it was just the two of us. It’s safe to say that, individually, we would not be close to that number. When I’m feeling lazy he pushes me and vice versa. Cycling in the middle of nowhere with no distractions is when we talk about work, family, parenting, our health and our dreams. We also plan vacations (around cycling ) and our retirement…which we hope will include a lot more cycling! It’s been good for our relationship! P.S. This is all the more remarkable when you realize that my husband lost close to a year when he was diagnosed with Leukemia (AML) in June 2011 and had a stem cell transplant in November 2011. The treatment nearly killed him and his recovery took time but cycling made him strong again! Gopro caught him stealing a kiss! I entered the BIKE FOR BREATH Facebook photo contest. My photo is called “Gopro caught him stealing a kiss”. If you’d like to vote for my pic and help me win a cool jersey that would be awesome! Step 4: Find our kissing photo and vote for it! It was a beautiful day in Saint John, NB. It also happened to be the day that Marathon-by-the-sea was taking place. We were a little worried setting out as our regular Sunday route intersected with the marathon route in several spots. We were afraid of hold ups and being re-routed. Our worries were all for naught. 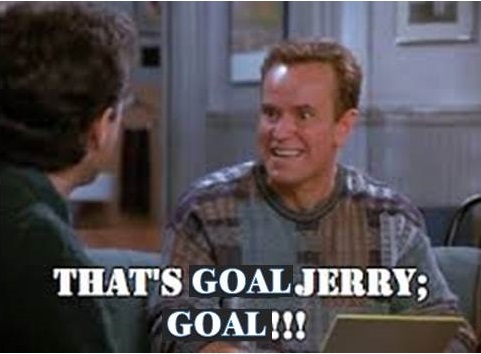 Not only was the marathon not an issue…it was an advantage! Our timing was perfect. We avoided the runners for the most part and the orange pylons set up all along the route ensured that vehicles gave us a wide berth. 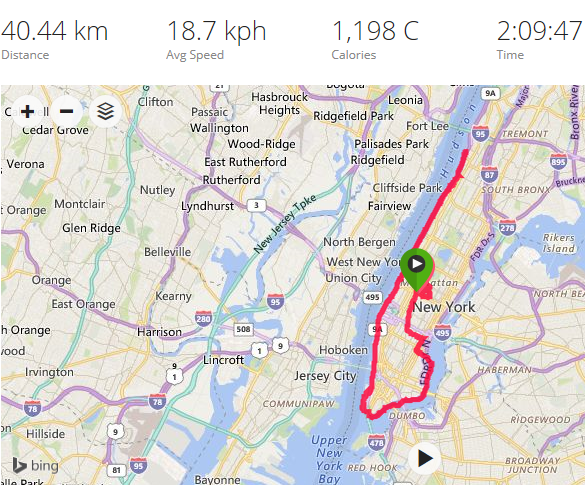 We did our regular Sunday route twice (total of 90 km) to get me to 2,000 km YTD! The New Brunswick Day long weekend took us to Cap-Pele, N.B. to visit friends at their cottage on the shores of the Northumberland strait. 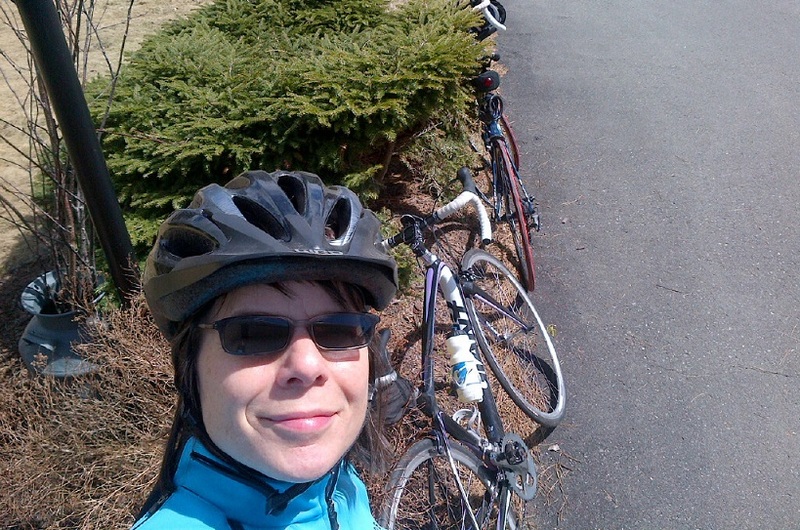 The weather was ideal for a ride in to Sackville for lunch (44 km away). We arrived to find the main street of this quaint University town closed to vehicles and crawling with preppies and hipsters setting up booths for their 9th annual SappyFest. Live music from a nearby tent entertained us while we sat at an outdoor patio and enjoyed a brew and some good eats. Oh how easy it would have been to spend the entire afternoon people watching and taking in the events but, alas, the shore was calling to us. We stretched the ride home a little to get the total mileage over 100 km. With over 1,500 km cycled so far this year, we’ve surpassed the 50% mark towards our goal. Year-to-date we’ve clocked more hours in the saddle over this time last year so, provided the weather and our health co-operate, we should have no problem reaching 3,000 km before the cold weather sets in. The top of “gas station” hill in Clifton Royal (Kingston Peninsula, New Brunswick) is one of my favourite places to stop, wipe my brow, catch my breath, have a drink and enjoy the view. The top of the hill provides lovely vistas of the Kennebecasis River, the shade of an apple tree and we get to watch the beautiful horse that lives here for a few minutes. Hubby took a photo of me last year in this spot and again today. I came up with a great idea…. I’m going to have hubby take a photo of me in this same spot once a year so I can see the changes. Here’s years 1 & 2 to start. A coffee table book signed by the 2014 winner of the Tour de France! If you are in to art, cycling and/or the Tour de France you might like this crowd funding project. For a $25 pledge plus $22 (shipping to Canada) you would get a copy of the 192 page book full of beautiful & original 2014 Tour de France cycling art (signed by the artist). I purchased a painting from Greig called “A Hard Climb’s Reward” as a gift for my hubby a while back. Greig Leach’s cycling art is awesome! I think this would make a great coffee table book for any home or bike shop! Left yesterday morning for a spur of the moment getaway to the Rossmount Inn in beautiful St. Andrews-by-the-sea, New Brunswick. Arrived at the Rossmount mid-morning, changed in to our cycling clothes and hit the road. 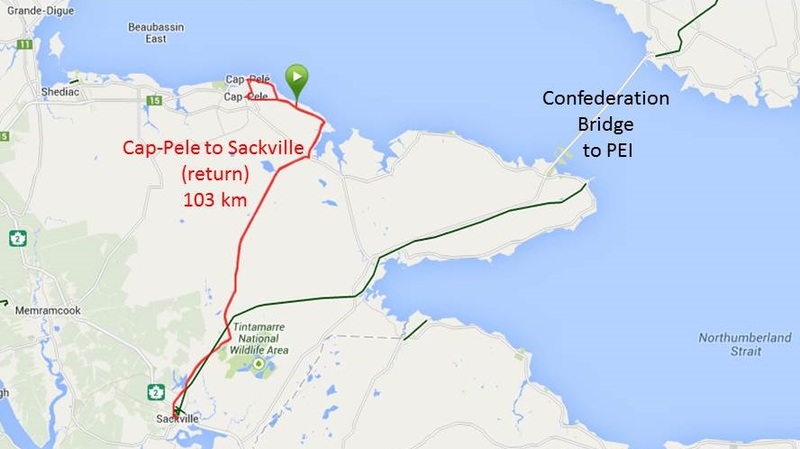 Our cycling route took us to St. Stephen, New Brunswick (a.k.a. Chocolate town) and then across the Milltown border crossing in to Calais, Maine. The U.S. part of our tour was brief…we re-entered N.B. at the St. Stephen border approx. 20 minutes later (and that included a very quick cheeseburger and bottle of water at McDonalds). I know…I know… McDonalds? We wanted something quick & cheap just to hold us over until our gourmet meal that evening. Arrived back at the Inn after a very hot (30 degrees celcius/ 86 degrees fahrenheit) & hilly 65 kilometre ride. A quick shower and we were relaxing in the shade of the veranda with a cold beer! Since we made our reservation last minute, the dining room could only seat us at 9 p.m. The meal did not disappoint and was worth the wait! Salad and appetizers were perfect. For the entrees I chose the duck and Rob chose the cod…both wonderful! We finished our bottle of Pinot Noir out on the veranda and, not long after, sleep was not hard to find!